London is known for museums, nightlife, historic sites, shopping, and parks. Your plan includes some of its best attractions: learn more about the world around you at Natural History Museum, steep yourself in history at Tower of London, admire the masterpieces at British Museum, and take in the architecture and atmosphere at St. Paul's Cathedral. To see where to stay, photos, traveler tips, and tourist information, read our London tour itinerary planner. Toronto, Canada to London is an approximately 10-hour flight. The time zone difference when traveling from Toronto to London is 5 hours. Traveling from Toronto in March, things will get a bit warmer in London: highs are around 12°C and lows about 3°C. Wrap up your sightseeing by early afternoon on the 28th (Wed) to allow enough time to travel to Granada. On the 29th (Thu), admire the natural beauty at Generalife, then contemplate the long history of Alhambra, and then appreciate the extensive heritage of Mirador de San Nicolas. Here are some ideas for day two: look for gifts at Munira, get the lay of the land with Walking tours, and then wander the streets of Albayzin. 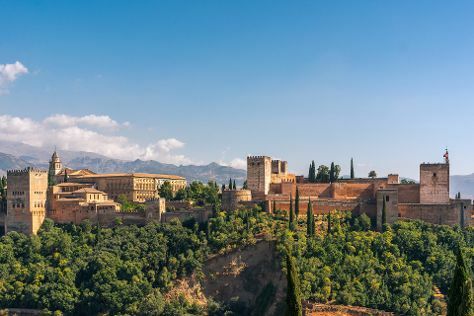 For ratings, other places to visit, more things to do, and tourist information, you can read our Granada online journey planner . You can fly from London to Granada in 5.5 hours. Alternatively, you can do a combination of flight, taxi, and train; or take a train. The time zone difference moving from Greenwich Mean Time (GMT) to Central European Time (CET) is 1 hour. When traveling from London in March, plan for somewhat warmer days in Granada, with highs around 19°C, while nights are about the same with lows around 5°C. Finish your sightseeing early on the 30th (Fri) so you can drive to Ronda. Ronda is known for historic sites, nature, museums, nightlife, and outdoors. Your plan includes some of its best attractions: explore the striking landscape at El Tajo, learn about winemaking at Descalzos Viejos S.L., get great views at Mirador de los Viajeros Romanticos, and take in breathtaking views at SierrAventura Ronda. To find where to stay, more things to do, reviews, and tourist information, read our Ronda route builder app . Traveling by car from Granada to Ronda takes 2.5 hours. Alternatively, you can take a train; or take a bus. 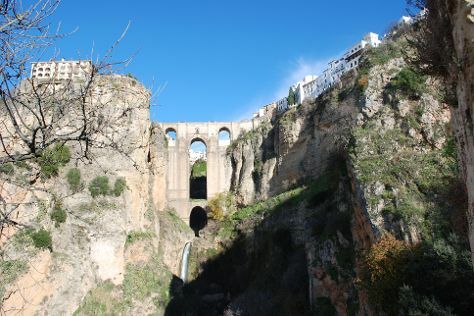 Traveling from Granada in March, things will get somewhat warmer in Ronda: highs are around 23°C and lows about 9°C. Finish your sightseeing early on the 2nd (Mon) to allow enough time to drive to Seville. Start off your visit on the 3rd (Tue): take in nature's colorful creations at Royal Alcázar of Seville, take in nature's colorful creations at Jardines de los Reales Alcazares, then admire the natural beauty at Parque de Maria Luisa, and finally admire the striking features of Plaza de España. On the 4th (Wed), you'll have a packed day of sightseeing: don't miss a visit to Metropol Parasol, get great views at Torre Giralda, make a trip to Plaza de la Virgen de los Reyes, then take a stroll through Barrio Santa Cruz, and finally take some stellar pictures from Seville Cathedral. To find out how to plan a trip to Seville, use our trip itinerary maker. Traveling by car from Ronda to Seville takes 2 hours. Alternatively, you can take a bus. In April, daytime highs in Seville are 24°C, while nighttime lows are 13°C. Wrap up your sightseeing on the 5th (Thu) early enough to travel to Lisbon. Lisbon is known for historic sites, zoos & aquariums, museums, shopping, and nightlife. Your plan includes some of its best attractions: admire nature's wide array of creatures at Lisbon Oceanarium, explore the world behind art at Museu Calouste Gulbenkian, appreciate the history behind Padrao dos Descobrimentos, and take in the spiritual surroundings of Jeronimos Monastery. For other places to visit, photos, ratings, and more tourist information, read Lisbon planner . You can fly from Seville to Lisbon in 4.5 hours. Other options are to drive; or do a combination of bus and train. Traveling from Seville to Lisbon, you'll gain 1 hour due to the time zone difference. In April, plan for daily highs up to 24°C, and evening lows to 13°C. Finish your sightseeing early on the 7th (Sat) so you can travel back home.